Following on from the highly successful limited Boxset ”Reformation 01”, Irish/English duo VNV Nation are set to release their next full-length album “Of Faith, Power and Glory”. The new album sees the band reach a whole new level musically. The album is more soulful and raw than ever before and shows VNV Nation moving into new musical territories with their own distinctive sound. 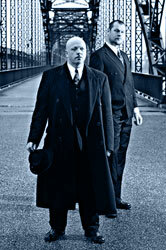 Despite all of their albums having received acclaim, “Of Faith, Power and Glory” is already being described by journalists as one of the best alternative-music albums of the last few years, not to mention being VNV Nation's finest work since their eclectic cult release "Empires" (1999). This is easily the band’s strongest and most profoundly evocative release yet that takes a big leap beyond what the band had achieved on previous albums. As with all of VNV Nation’s albums, the title describes the album’s theme. In this case, it is a commentary on ourselves as individuals or on humanity as a whole. Faith, Power and Glory; three things that, in succession, can bring people to the greatest of heights and achievement, or that can corrupt and destroy. The artwork, created by renowned Polish graphic artist Michal Karz, depicts a memorial in the middle of a wasteland, representing the idealistic monuments humanity has built to its solemn, greatest hopes, as a consequence of displays of its capability for brutal extremes.